A project to upgrade stoves at Kagando Hospital has sparked community interest in fuel-efficient stoves and opened up new entrepreneurial opportunities in a rural Western Uganda. AHEAD Energy arranged for International Lifeline Fund (ILF)staff to lead a week-long workshop In March 2011, on the proper construction, use and maintenance of rocket stoves at Kagando Rural Development Center (KARUDEC). Like most medical facilities in Africa, Kagando Hospital does not supply meals to patients. 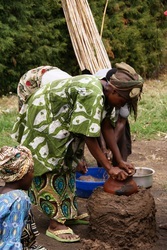 Rather, family members or friends of the patient bring food and fuel, and cook meals in a common kitchen. The typical cooking “stove” in rural Africa consists of three stones on which a pot can be set. The typical fuels are firewood, crop wastes and charcoal. 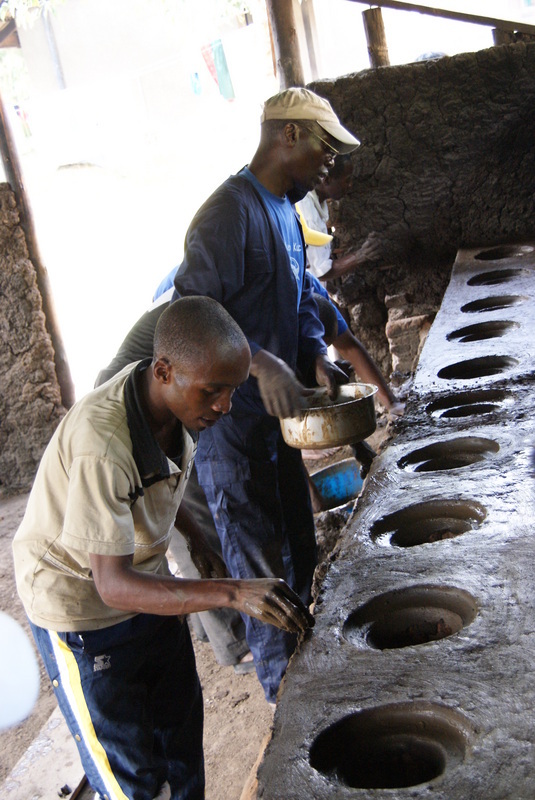 At KARUDEC there can be 25 – 50 cooks per kitchen cooking over 3-stone stoves. The indoor air pollution that this creates has severe health consequences. The World Health Organization estimates that cooking smoke is responsible for 1.5 million deaths each year, most of them women and children. 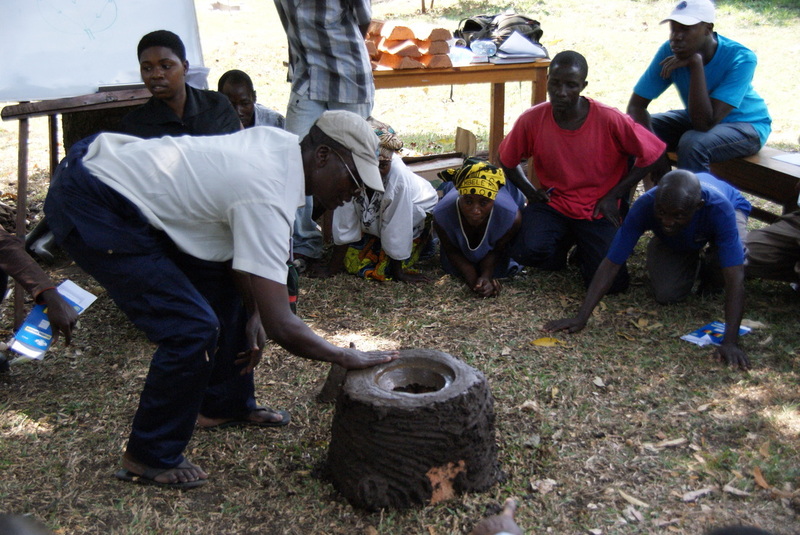 There is an incredible need for fuel efficient stoves in Western Uganda as tree cover in the region is visibly scarce and the cost of firewood is high (enough firewood to cook one meal sells for 200 Uganda shillings (roughly 9 cents per meal) -- a significant cost to rural Ugandans. ILF has developed a simple mud and brick rocket stove that reduces harmful emissions by 25% and reduces firewood consumption by up to 50%. 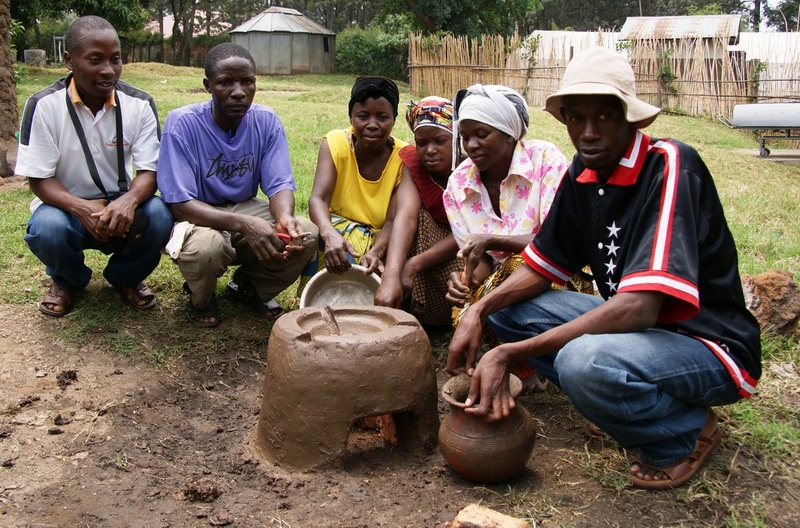 These stoves cook faster, using less fuel, which saves time and money. Such efficient cooking also releases less soot, thus reducing the amount of greenhouse gases emitted to the atmosphere. 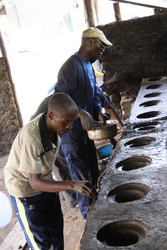 And because cooking fires are contained within a stove cavity, it is less likely that cooks and their children will be accidently burned. 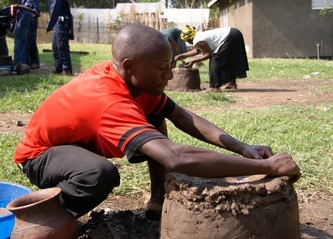 The March stove training included 40 men and women from all segments of the KARUDEC community. 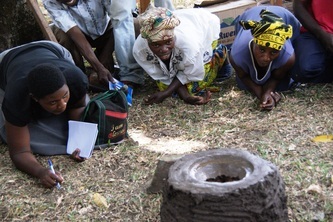 Thirty-five graduated with a Certificate of Completion in rocket stove technology. Due to the enthusiasm of the participants and the very clear need for fuel efficient stoves, an effort is being mounted to build a kiln at KARUDEC to supply insulated bricks for stove building. 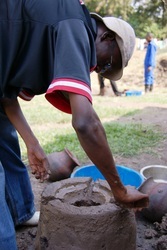 This would ensure complete project sustainability. 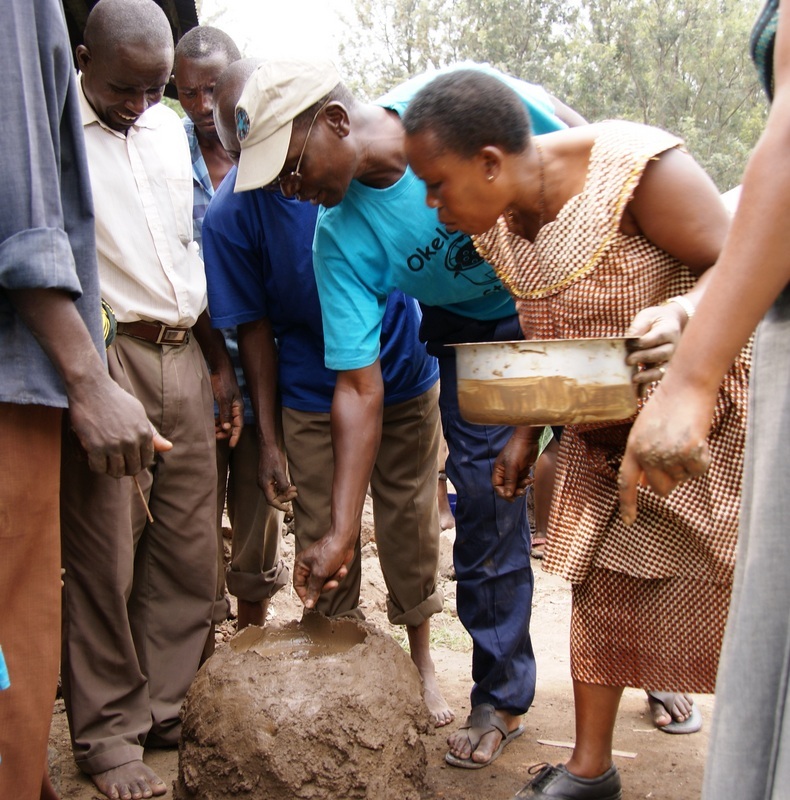 For this project, ILF experimented with the use of murram, a durable material readily available in the foothills of the Rwenzori Mountains but not found elsewhere in Uganda. 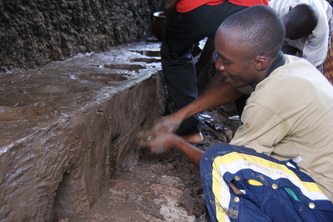 The team achieved a plaster mixture that is even more durable than that used elsewhere. 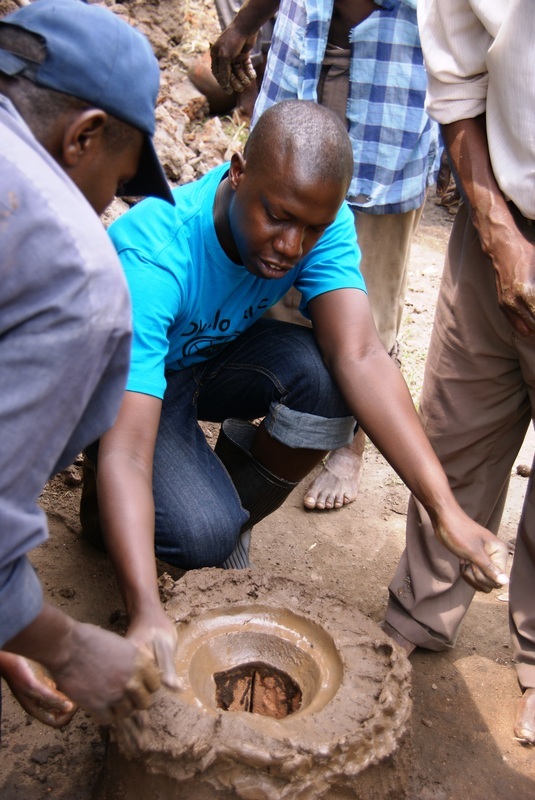 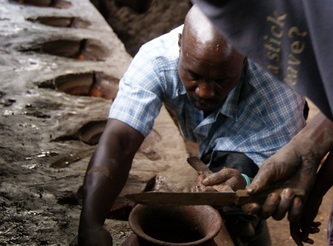 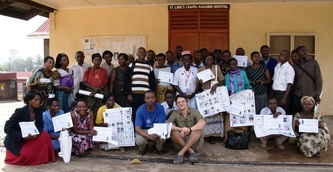 Part of the workshop included building 42 fuel-efficient cookstoves in the Attendees Kitchen at Kagando Hospital. 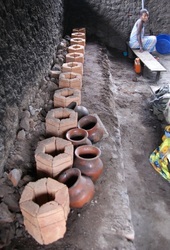 The six brick rocket stove is traditionally mudded as a standalone stove, but in order to maximize the number of stoves in a relatively small communal kitchen, one continual “embankment” was needed. 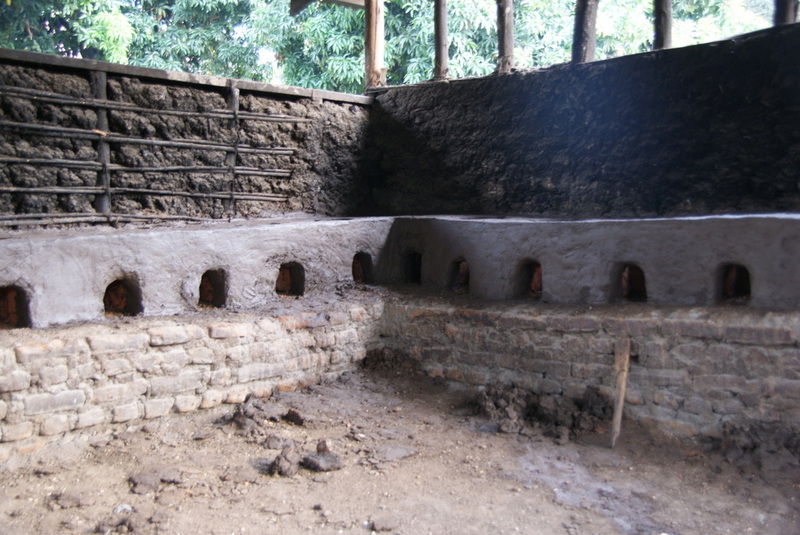 Drawing on the team’s collective background in plastering, stove construction, and masonry, a solution was quickly found that provided optimal spacing to allow each cook enough room to cook side-by-side during peak hours. This project, funded by the Women of the Evangelical Lutheran Church, will continue to expose people who come to Kagando Hospital to the availability of efficient stoves and provide them with information about having an efficient stove installed in their homes.